The local economies of Hilton Head Island and Bluffton can be summed up very simply using a well-known, yet rarely defined, figure of speech called a metonymy. A metonymy is when you substitute the name of a thing with the name of something else with which it is closely related. Our local metonymy would be the classic “surf and turf.” In this case, Hilton Head Island is the surf and Bluffton is, naturally, the turf. Together they combine to form a perfectly paired partnership, with the finest quality and variation that any property owner or future property owner could imagine. To accurately compare the surf against the turf, one must look deeper than statistics and dollar volume. Unique characteristics make each market exceptional in its own way. There is the mild climate, the outdoor/active lifestyle, the food, the beach, the salt water rivers, the affordability, the exclusivity, and the list goes on. Thinking again of surf and turf, each could stand on its own as a delicious meal. But plated together, they are sublime. For the number crunchers, here are a couple of interesting stats regarding the overall real estate markets on Hilton Head Island and in Bluffton. In 2016, in Bluffton, there were a total of 1,789 single family home sales, 83 villa/condo, and 242 lots for a total of 2114 transactions in. On Hilton Head Island, there were 896 single family homes sold, 942 villa/condo, and 115 lot sales for a total of 1,953 transactions. But, it’s all about the money, right? The overall dollar volume transacted in each area tells a different story. In 2016, Hilton Head Island had a total transaction volume of $1,763,012,180.00—yes, that is billion with a B. The Bluffton transaction volume was $1,332,728,574.00, which isn’t too bad for a sleepy little fishing village. Of course, some folks expand their search beyond the immediate Lowcountry. Here is a little nugget to chew on while you are thinking about whether you should buy in Charleston, Savannah or the Hilton Head Island/Bluffton market. As Bluffton has risen from the ashes of the 2008 crash, an interesting occurrence has materialized in our real estate market. Hilton Head Island alone has had trouble competing with its in-state rival Charleston and its historic neighbor Savannah, which shouldn’t be much of a surprise, given the greater metropolitan feel and comparable beaches to the north and south. 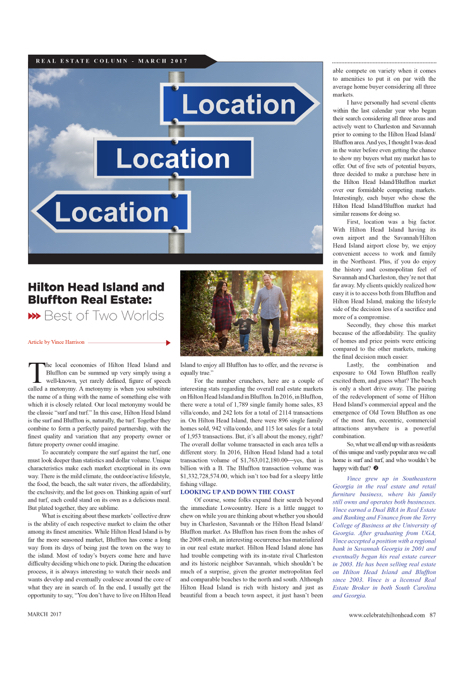 Although Hilton Head Island is rich with history and just as beautiful from a beach town aspect, it just hasn’t been able compete on variety when it comes to amenities to put it on par with the average home buyer considering all three markets. I have personally had several clients within the last calendar year who began their search considering all three areas and actively went to Charleston and Savannah prior to coming to the Hilton Head Island/Bluffton area. And yes, I thought I was dead in the water before even getting the chance to show my buyers what my market has to offer. Out of five sets of potential buyers, three decided to make a purchase here in the Hilton Head Island/Bluffton market over our formidable competing markets. Interestingly, each buyer who chose the Hilton Head Island/Bluffton market had similar reasons for doing so. First, location was a big factor. With Hilton Head Island having its own airport and the Savannah/Hilton Head Island airport close by, we enjoy convenient access to work and family in the Northeast. Plus, if you do enjoy the history and cosmopolitan feel of Savannah and Charleston, they’re not that far away. My clients quickly realized how easy it is to access both from Bluffton and Hilton Head Island, making the lifestyle side of the decision less of a sacrifice and more of a compromise. Secondly, they chose this market because of the affordability. The quality of homes and price points were enticing compared to the other markets, making the final decision much easier. Lastly, the combination and exposure to Old Town Bluffton really excited them, and guess what? The beach is only a short drive away. The pairing of the redevelopment of some of Hilton Head Island’s commercial appeal and the emergence of Old Town Bluffton as one of the most fun, eccentric, commercial attractions anywhere is a powerful combination. Vince grew up in Southeastern Georgia in the real estate and retail furniture business, where his family still owns and operates both businesses. Vince earned a Dual BBA in Real Estate and Banking and Finance from the Terry College of Business at the University of Georgia. After graduating from UGA, Vince accepted a position with a regional bank in Savannah Georgia in 2001 and eventually began his real estate career in 2003. He has been selling real estate on Hilton Head Island and Bluffton since 2003. Vince is a licensed Real Estate Broker in both South Carolina and Georgia. C2 Fashion: How’s your short game? Ready to find out? It’s…All About Me: Make Me Over Time!